Project Rendering. Image Credit: Steven Harris Architects LLP. Revised plan eliminated glass tower from design, lowered walls and recessed addition. 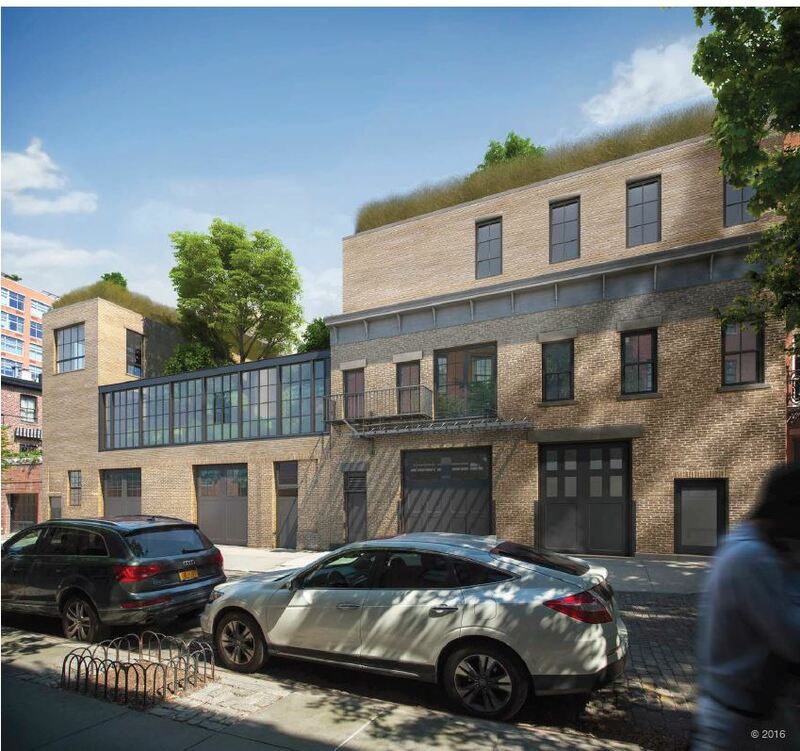 On October 11, 2016, the Landmarks Preservation Commission voted to approve an application for the redevelopment of two buildings at 85 and 89 Jane Street in the Greenwich Village Historic District. The existing buildings date to the late-19th an early 20th centuries, though heavily altered, and are identified as utilitarian in style in the district’s designation report. The buildings are going to be merged and converted into a one-family dwelling. Owned by an LLC, it has been reported that the buildings’ purchaser is Jon Stryker, billionaire heir to the fortune of a medical supply company founded by his grandfather. Landmarks considered a previous redevelopment plan for the site at its meeting on July 12, 2016. The applicants proposed to build a two story wall above the existing one-story garage building at 89 Jane, with large steel-framed windows recalling the area’s historic industrial architecture and allowing glimpses of the plantings behind the wall. At 85 Jane Street, the cornice would be removed and a one-story addition to 85 Jane Street would be faced in charred Japanese ash. 85 Jane projects further into the street wall than do the front facades of adjoining townhouses, and the addition would create a new three-story face at the street wall. A translucent glass tower, rising four stories above the roof of 89 Jane Street, was presented in the plan. The tower be occupied by a dining room, studio, and library. Extensive plantings would be part of the project, with large interior courtyard gardens and greens roofs. The applicants estimated that one million tons of soil would be trucked in for the gardens. Commissioners agreed that the proposal was inappropriate for the site, particularly criticizing the planned glass tower. Commissioners also found the street wall additions excessive in the height and bulk, and some objected to the choices in materials. The applicants returned to Landmarks with a revised plan presented by architect Steven Harris. The glass tower was entirely removed from the proposal, and the heavily glazed wall above the existing building at 89 Jane was lowered by more than 13 feet. An eight-foot-tall one-room penthouse would be built above 89 Jane, sited roughly where the tower was in the earlier plan. There would be a terrace above the penthouse. 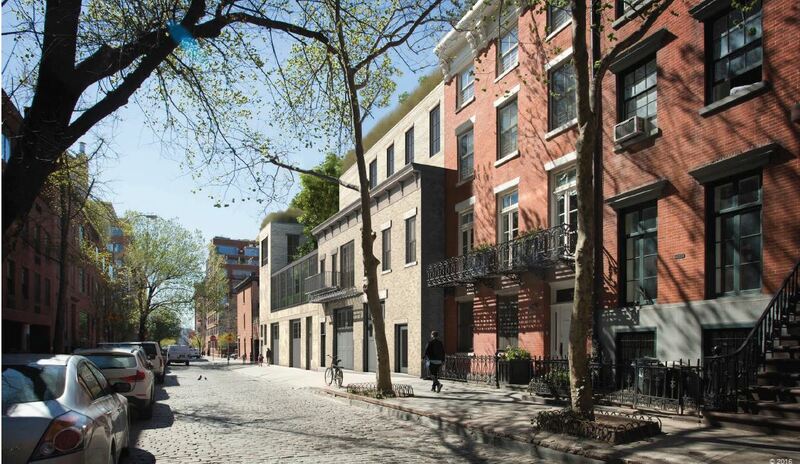 An elevator bulkhead and enclosure for mechanical equipment would also be built above the roofline, set back 50 feet from Jane Street, that Harris said would blend in with the taller building on the other side of the block facing Horatio Street. The elevator would be necessary for to bring equipment to the roofscape to maintain the plantings. At 85, the applicants would restore the facade to its historic appearance, based on a 1930s tax photograph, including its cornice. The addition would now be clad in roman brick, in a beige color close to that of the historic brick. Because the historic brick is of conventional dimensions, there would be a clear delineation between the new and old fabric, while maintaining a consistent masonry façade. The addition’s facade would be set back from the lower stories, to align with facades of the adjoining row of townhouses. Commissioner Michael Devonshire objected to the loss of a brick parapet wall which would be replaced by the addition at 85 Jane. He found the applicants argument that the parapet would need to be reconstructed, and therefore would be inauthentic, unpersuasive. Devonshire argued for setting back the facade of the addition to 85 Jane, making it a “subservient facade.” Commissioner John Gustafsson agreed, and noted that utilitarian buildings like garages have grown in significance in historic preservation thought since the district was designated in 1969. LPC: 85, 89 Jane Street, Manhattan (18-1551) (Oct. 11, 2016) (Architects: Steven Harris Architects). So much for density in Manhattan.